Because I have a host, bad thing is VPN, way cheaper. No armor/weapons, can farm and do alchemy, way worst than the classes based on that, but better than the rest of the classes. XP on combat, alchemy and farming (the last two less XP). Bonus unarmed DMG and more walking speed. The skill tree oriented arround to combat(with mobility) and farming/alchemy, wich can lead to specialized characters for combat, hibrids or pacific characters. Still, when you choose the class +2 dmg to unarmed combat and a 10% extra speed, for, at least, letting you defend yourself if you are in a bad spot. Still, this is a suggestion about the monk class as how do I see it. The other unarmed character option, fully combat oriented, wouldbe a martial artist/brawler focused only on unarmed combat. Well gell me your opinion, if you want I can make a "skill tree" concept if you like it! Sorry for the confusion Werff, the new skill tree isn't going to be how you think! There won't be a 'Monk' class because there won't be any classes! ...Not really, anyways. The update will pursue something more along the lines of the Path of Exile skill tree where every character shares the same tree. Has a high amount of customization, and a limited number of skill points. What you described in your post will be possible with the new tree... just done differently than you expected. 7GB of RAM. Probably not going to be switching for now, though. We'll see what happens. And for the host ok, it's yout choice after all! When the new skill tree is done I will surely enter your server! Fixed a bug where crops would not drop anything. Fixed a bug where melons trying to grow would crash the server. Reduced the time required online for a Citizen to create goods to 24 minutes. Fixed a bug where the level-up indicator would not go away. New version, get! Mostly just bugfixes, thanks to testers on the issue tracker. Citizens have reduced happiness generation and higher unhappiness generation. Various foods that have cooked versions have a chance to make the player sick if consumed raw. Farmers now generate increased quality by fertilizing per level. Removed the hunger requirement for the natural heal-over-time, but slowed the healing drastically; healing occurs faster if you are not hungry. Fixed a bug where animals could not be cured of sickness using mushroom stew or golden carrots. Fixes a bug where certain crafting recipes that should have items remaining in the table after crafting were incomplete. Fixes the brewing stand and brings it up to date for 1.10.2 brewing. Increased the cost of crafting deeds to a gold ingot instead of a gold nugget. Fixed a bug where hitting players with an arrow as a player would crash the server. Fixed a bug where players could not damage other players. Some new stuff for once! Check it out! Fixed a bug where citizens would not reach desires that should be in reach. Fixed a bug where income would not properly update a players CC in GUI. Added logging for Citizen income. Increased the RemoveTouchFlagTimer for animals. Fixed a bug where crafting certain items that did not give XP would still cost exhaustion. Reduced exhaustion for crafting overall. Fixed a bug where animals could be overfed or 'cured' when not sick. Ore blocks can no longer be placed except in Creative mode. Taking damage from starvation causes GUI's to close. Fixed a bug where animals would not be tempted by their favorite foods. Fixed a bug where chickens were not interested in eating carrot seeds. New update. Some experimental changes. Am interested in feedback. Fixed the income alert message to specify what you received. Fixed a bug where boats could break lilypads in Polyzones. Fixed a bug where custom foods could not be used as potion ingredients. Fixed a bug where potion brewing would not give spellbinders progress. More bugfixes, but this patch is definitely required. Animal performance is waaaaay better than before. Was the primary source of lag before, and it's pretty much unnoticeable now. Also it's stonefist mean't to increase damage or let you break blocks "easier"? Now fear my 4 punches per second MUAJAJAJAJA!!! Also how much dmg is increased per time you take the unarmed damage perk? Right now there are no numerical values assigned to anything on the tree- it's just conceptual. I've started coding the systems behind it, but the numbers are still up in the air. 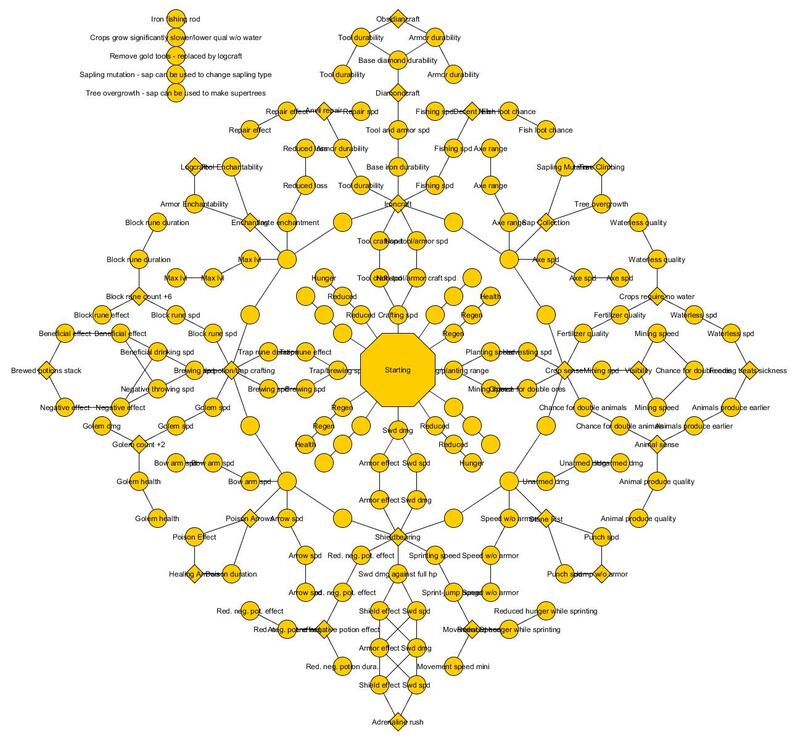 What's important with the concept-tree is the system requirements. 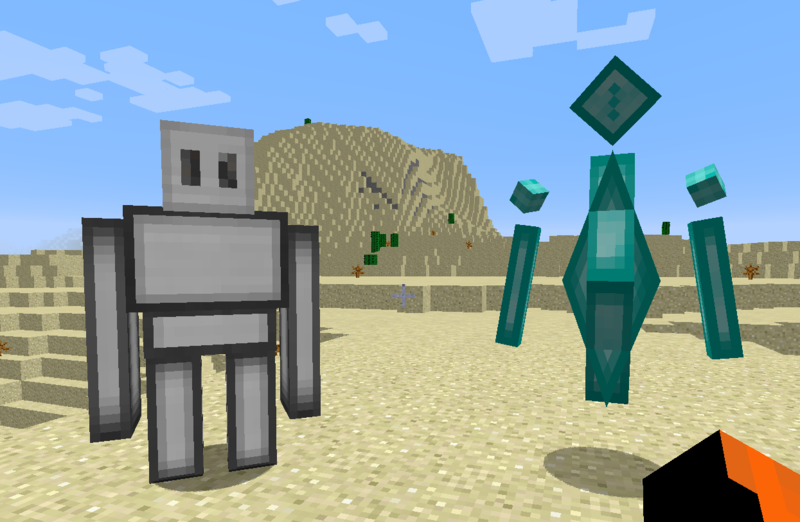 Obviously we couldn't keep the old Iron Golem. He had a Villager face, and Villagers don't exist in LoMaS.. (Plus some other changes under the hood, but whatever :P) and a new golem, to spice things up. He hovers and shoots sharp things. His little shoulder dealies slowly spin. The XP gathering system still hasn't been overhauled, so leveling up probably takes years. Working on a fix for it, but in the meantime remember you can use the /scm help commands to change your level manually. Let me know if you find any bugs, as usual. So.. what was the IP of the server? Although fair warning, it's pretty empty. The current version of the mod only has 10 downloads, after all. Please make it just a plain number increase, like 1 point per skill level, that would be more efficient. 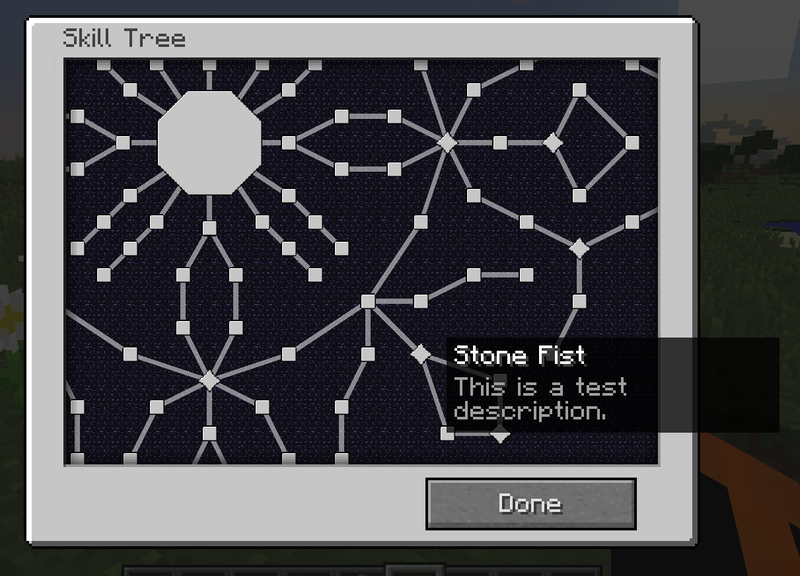 Also there are any kind of admin commands for me to test on singleplayer the skill tree? Yea, the punching damage nodes need to be buffed, I think. Easy enough change, though. '/scm set level <number>' which sets your level to whatever number you specify.